One daughter was Barbary Brimer who married John Birchfield. 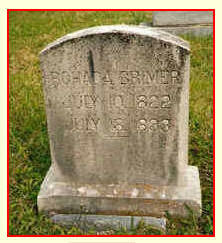 *Note: Per findagrave.com, John Brimer was born December 13, 1845 and died August 3, 1934 in Jefferson County TN. He married Sarah Jane Hobert November 13, 1866. He is buried in Lawson Chapel Cemetery in that county. Rhoda, the daughter of Jacob and Elizabeth Priddy Miller, married "Rip" Brimer. Rhoda was born on July 10, 1822 and died on July 18, 1893 in TN. On Sept. 20 1863 they had two sons born, twins, George Washington Brimer and Thomas Westley Brimer. George married Martha Emmaline Mount (1871-June 1913) on August 19, 1892, and they had 7 children together. George died in TN on 5 Nov 1931 in Knoxville TN at the age of 68. 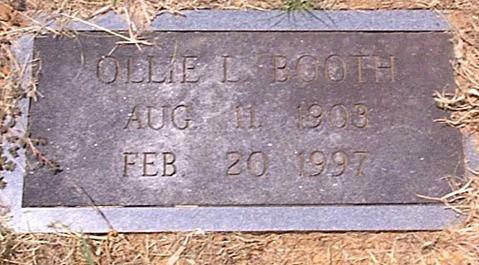 He was buried at Woodlawn Cemetery in Knoxville, TN 3 days later. At the time of his death he was a widower living at 161 Washington St. in Knoxville and was a "carpenter" per the Tenn. Deaths and Burials Index. "Rip" shows up in the 1880 census for Knoxville, TN with his wife, Rody (Rhoda). Vineyard is 63 (born about 1817) and Rody is 51 (born about 1829). Their sons are (Our Line) George W. age 16 and twin Thomas age 16 born Sept. 20, 1863 in Jefferson County, TN; and a daughter, Sarah Brimer is 14 (born 1866). Vineyard, George and Thomas are all farmers and Sarah and Rody are keeping house. Rody is unable to write, but evidently can read some at least. George, Thomas and Sarah have all attended school within the past year, but Sarah is listed as also not being able to write. 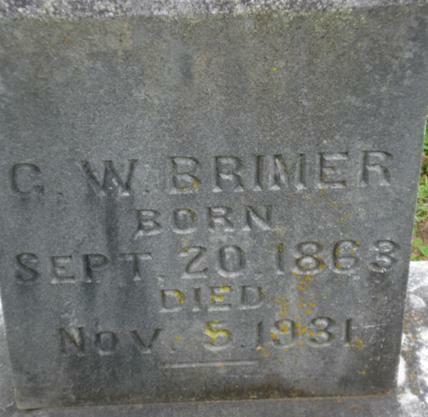 George Washington Brimer was born September 20, 1863 and died November 5, 1931, both in Jefferson County, TN. 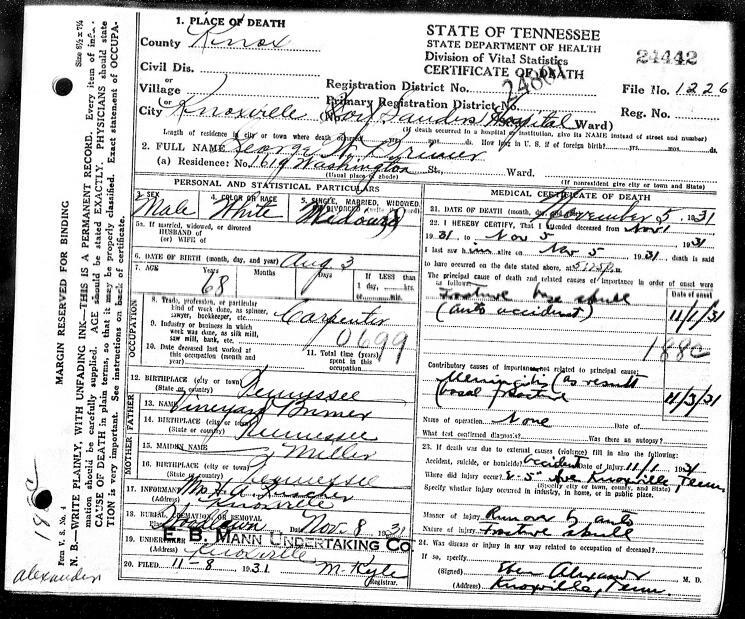 George married Martha Emmaline Mount on Aug 19, 1892; he was a Baptist Minister and a Home Builder. 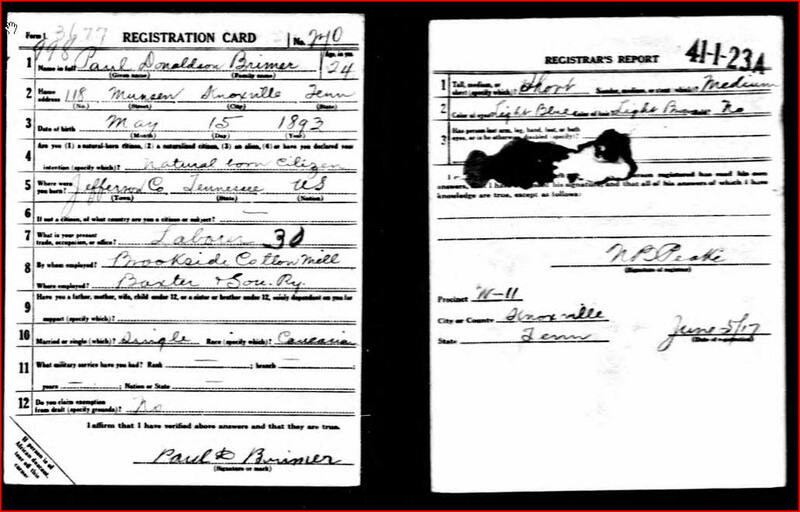 Death Certificate 11/5/1931 for George Washington Brimer, states that he was run over by a car which fractured his skull, after which he contracted meningitis and died. Both buried at Woodlawn Cemetery, 4500 Woodlawn Pike, Knoxville, TN. Also buried here is their son Paul Donaldson Brimer, U.S. Army, WWI May 15 1893 to Feb 22, 1991. 3) Georgia "Georgie" Forrest Brimer b. Aug. 22, 1897; m. Herman A. Fischer; d. March 4, 1971 in Knoxville. They had two children: Herman A. Jr. and Beverly Forrest Fischer. They had daughter Peggy Marie Brimer. Per 1930 Census Nip became divorced. 8) Gla dys Emmaline. Gladys was the youngest child of George W. and Emma Mount Brimer. She married Joseph Eric Legg and had two children: Barbara Jean and David Leon. Gladys born Jan. 28, 1908 and died Jun. 1, 1999 in Tennessee. 9) Bernard (Bernie) Brimer, born 1910. In the next 20 years, by the turn of the century, George Washington Brimer has married (7 years ago in 1893) his bride, Emma Martha Mount (or perhaps Martha Emmaline Mount) and they have started their family. In 1900 they have 3 daughters and 1 son. All of their children are living. The son is Paul D. born May 1893 (age 7) and daughters are Lillie Branch born July 1895 (age 4), Georgia (called Georgie!) F. born August 1897 and infant Cora E. born Sept 1899 (our line). George is farming. All members of this household were born in TN. 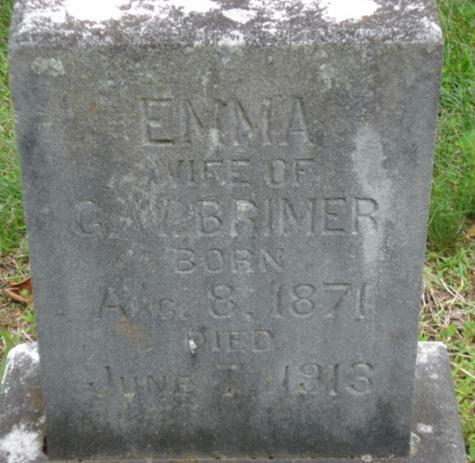 Another 10 years passes and we now find George W. Brimer and wife Emma Martha are ages 46 and 38 respectively. They married when George was about 19 and she about 17 and have 7 living children out of a total of 9 births. They have suffered the passing of two children sometime in the past 10 years and heralded the arrival of several more. George is working as a farmer. The oldest child is son Paul who is 16 and working as a farm laborer on a home farm. Leila B. is 14; Georgie F. is 12; Cora E. is 10 and Daisy N. is 8. Ollie (Olivia) is 6; Napoleon "Nip" Vineyard Brimer is 4; Gladdis E is 2 and baby son Bernie is listed as less than 1 year old. All are TN born to TN-born parents. 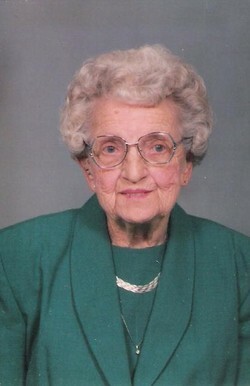 The passing of the next 10 years is likely traumatic on the family as wife and mom Emma Martha has died. George's age is so different in these various censuses! In this 1920 census, George is listed as 48 and son Paul as 22. In the 1930 census, George is listed as 66! George is already a widower in 1920 and is renting a home and working as a quilt roller at a cotton mill; Paul is not working. All are listed as born in TN to TN born parents. Younger children in the home are daughter Daisy who is 18 and works as a saleslady at a hardware store; Ollie who is 16 and works as a waiter at a drug store; Nip, 14; and Gladys 11. Daughters Leila/Lillie and Georgie and Cora are no longer living at home with their parents. And, son Bernie may has died as he is not listed here. 1920 Census for George Washington Brimer, District 99, Knoxville, TN at 1029 Wray Avenue. In the 1930 census, George W. Brimer (66!) and his son Nip (24) are living with his daughter Georgia and her husband Herman A. Fisher. George is widowed and Nip appears to be divorced. George is a house carpenter and Nip is a machinist for an auto shop. Herman is a master mechanic at a knitting mill. Herman and Georgia own the home worth $6760, which is not a farm...and they do own a radio set. Herman is 35, married at 23; Georgia is 32, married at 20. They have a daughter Beverly F. Fisher (10) and a son Herman A. Fisher, Jr. (4). All were born in TN to TN born parents. Cora Eliza Brimer was born 1899 and died 1982. She married John Wesley Russell. John was the son of Joseph Russell and his wife Martha who both died of old age in about the 1940s. John was born on July 20, 1894 in Tazewell, Claiborne County, TN; and died in Knox County TN on September 14, 1974. 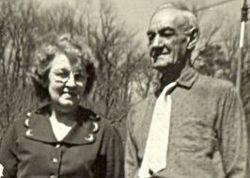 Cora and John Wesley Russell had five daughters: Marion, Maxine, Wanda, Wilma Deane and Marlene. John was a WWI veteran. John is buried at Highland Memorial Cemetery in Knoxville. When John Russell completed his registration card for WWI draft, he was living at 317 Churchwell Ave. in Knoxville and was a knitter for Standard Knitting Mills at 1400 Washington Ave. in Knoxville. He was single and declared that he was physically disqualified for the military. John W., a flagman for the railway, and Cora E. Russell are living in Tennessee with three daughters, Marion P. (8), Maxine (5), and Wanda Lou (2years 1 month). Cora and John married when he was 25 and she 21. They are now 34 and 30, respectively. They own their home on 317 East Churchill Avenue. 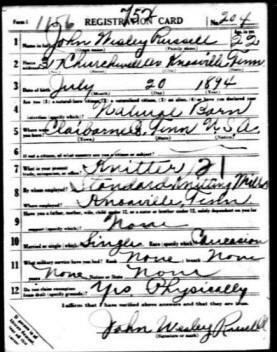 There are lots of Russells listed on this census page: Joseph T. (dairy farmer) and Martha Russell at #319; Walter (machinist), Opal and nephew James Russell at #323; All are born in TN to TN born parents. Family Memory: Joseph T. and Martha Russell both spoke German and "yelled" at each a lot - loud, but loved by John Wesley Russell. John was self-educated and worked for many years as a freight conductor for Southern Railway. Another Russell on the same street is Walter * Brownlow ("Brownie") Russell, a machinist, and his wife Opal and their *son James Russell. They live at #323 with the *Frank and Vina Bowman family. Walter and Opal are the brother and sister-in-law of Frank Bowman (head of household), Melvina A. Bowman is a Russell. * Walter is 30 and married at 24 to the 19 year old Opal who is now 24. The Bowman/Russell household is next door to the John Wesley and Cora Russell household. NOTE: #323 was later changed to #409 by the City of Knoxville.